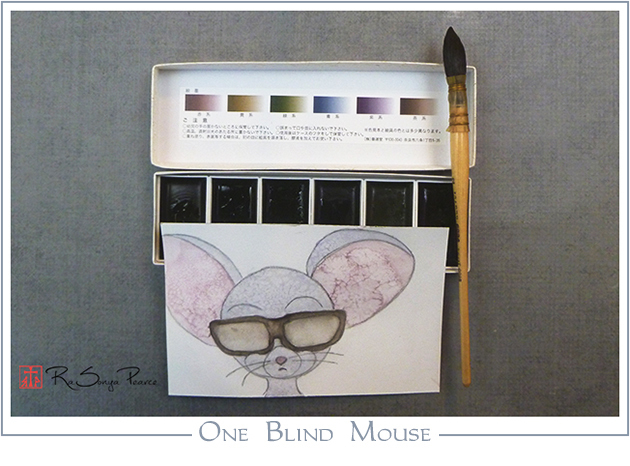 I had a visit with my Retina Specialist Monday and had my eyes dilated, so I was one blind mouse. I managed to draw my mousy self, but even with two pairs of sunglasses and the screen on low I couldn’t stand to use the computer. So that’s why this is a tad late, sorry. My eye was stable so I got to skip the Lucentis injection!!! Yay!! Unfortunately, the nurse prepped for the injection with all the drops and Betadine (Booo, Betadine!) so my eye is achy. This just validates what I’ve suspected all along, it’s the Betadine and not the injection that leaves my eye sore. It’s no wonder, that’s some pretty nasty stuff to be dropping into an eye. I’ve been wanting to try out my Boku-Undo E-Sumi watercolor paints and this was the perfect piece for them. All the colors in the mousie are from the set. Despite sumi in the name, these are watercolors. They are all lovely, subtly tinted blacks- Reddish, yellowish, greenish, blueish, purpleish and brownish. I love them!! They wet up quickly, dilute to very nice washes and react very well. I highly recommend them. Tammie, sorry I just was going through the blog and realized I replied to your comment on the wrong post!!! The colors are great and much more transparent than I would have imagined. A lot of the watercolors from Japan are more opaque, almost a bit like gouache. Very subtle and fun! so kind of you to respond. 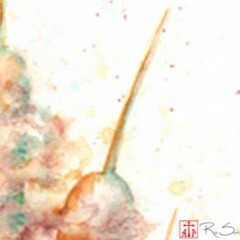 I don’t think that i have ever tried a Japanese watercolor. Look for the Kuretake Gansai paints. They behave somewhere between a watercolor paint and gouache, fun! They can dilute out like artist paints or be used nearly opaque like gouache.